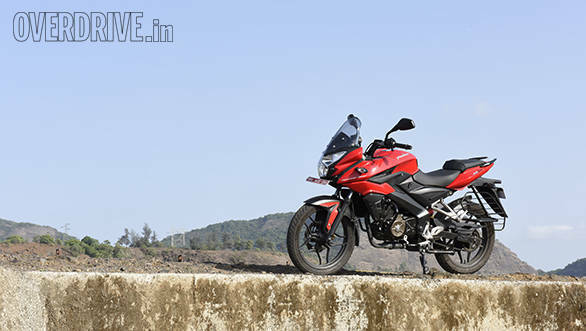 With the Adventure Sport twins, Bajaj has added two more motorcycles to its already sizeable Pulsar line up. The AS 150 is the second 150cc engine but brings four valve technology to the mix. This time around, we add some numbers to out first impressions to build a complete picture. We are fans of the way the Pulsar AS twins look. The fairing really has managed to build on the strengths of the 200NS into something rather attractive. The fairing with its upright chunky windscreen cuts a pretty silhouette and the vertically stacked projector and conventional headlight combo set up (they work great in the night) also add to the pretty picture. While the looks are spot on, the build quality also is another welcome step up for Bajaj but there still are some hiccups. Some of the panels on the rather busy (not as busy as the RS200) bodywork don't quite line up perfectly with each other and after just a few thousand kilometres on the odo, there is already a little bit of rattle creeping in at really high revs. The seating position is similar to the 200NS that is to say that it's a good balance between sporty and comfortable. The handlebars are not quite as high as they could be on an adventure motorcycle but the few days I spent on the saddle, I had no complaints. It features the same perimeter steel frame chunky front forks and rear mono shock but with smaller profile MRF tyres compared to the Eurogrips on the AS 200. 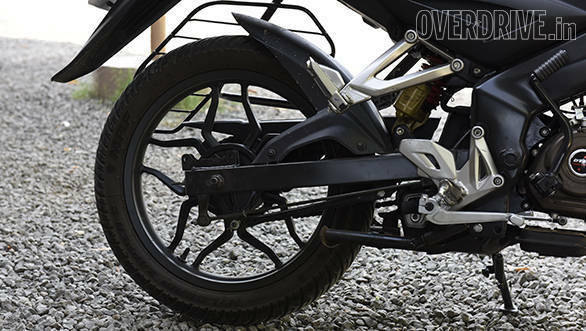 Bajaj has changed the stiffness of the frame and suspension combination with slightly softer springs and a less taut frame that adds up to a 20 per cent softer setup to give familiarity to new customers. We'll speak about how this has affected the handling and ride quality later though. 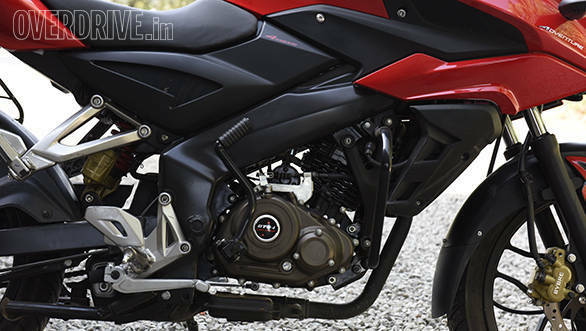 The all new 150cc four valve engine brings some interesting figures to the 150cc class. To start with, it's the first under square engine in the Pulsar line-up, and shares the same 56mm bore as the Discover 150. Its 17PS power output is second only to the 18.5PS CBR150R and equal to the Yamaha R15's. It also features a four valve head like the Discover engine but that's where the Discover similarities end. It's quite refined in terms of vibrations though the thrashy engine note betrays its air cooled single layout. The vibes are only really noticeable through the foot pegs when the tachometer needle nears redline. Power delivery is smooth too and fairly linear with a slight surge upwards of 7,000prm up till the rev limiter. Strangely, the characteristic long stroke mid range punch is missing and the AS likes to be revved to get a move on. It doesn't hinder the riding experience though and there is enough torque in the motor so you're not manically shifting up and down the box in town. There is some sponginess in the gear shift linkage though that makes gear changes soft and not crisp, as they should be. In our acceleration runs, the AS crossed the 100kmph mark in 21.85s and went on to a top speed over 125kmph. It's quite efficient too, returning a very respectable 52.8kmpl in our combined city and highway run. Don't head to show rooms expecting long travel suspensions and go-anywhere credibility from the AS 150. Bajaj was quite clear at the launch that the AS twins are only to introduce the customers to the 'adventure' tag line with adventure styling. The suspension set up and riding position are more sporty street motorcycle rather than the smooth ride quality of an adventure sport. 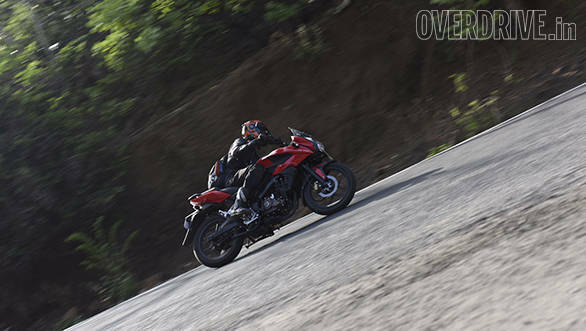 With the AS 150, Bajaj has softened the setup because of feedback that the 200NS was too stiff and it wants new customers of the Pulsar brand to feel comfortable. In our books, we find the soft feeling a little over done. In normal riding and while cruising around, the motorcycle was great with firm but comfortable ride quality that absorbed almost everything we could throw at it. But when we tried to up the pace, it soon started to feel soft. Try to turn into a corner quickly and the bike does a little wobble and when you step on the brakes, the front lever feels a little squishy. So while it's perfectly amicable at sedate speeds, when you up the pace, it's not much fun. While Bajaj is known for giving us excellent value for money products packed with features, we think they've slipped up here. At Rs 93,000 on-road in Mumbai the AS 150 is almost Rs 8,500 more than the Suzuki Gixxer - a motorcycle that does almost everything better. The AS 150 certainly isn't a full blown adventure sports motorcycle but it's in no way a bad one. It's still a feature rich motorcycle with a powerful and efficient engine but is it worth the premium price tag?